I didn’t really have time to write anything yesterday so I thought I’d just do a little show and tell on the new dolls but Tim’s all “aren’t you even going to talk about them”. Guess he figures if he has to listen to me chatter on about these dolls all week that the rest of you should have to as well. So here’s some chatter for ya. These gals might not look it but are actually quite different than the Kit and Chloe I’d started a few weeks ago. I decided to make their bodies longer and thinner so they look more like the older girls they are than toddlers. This also will make them easier to dress I think. Another difference is I made their bodies out of two layers of quilting cotton instead of the wool felt I’d used on the first two. I was worried it’d be too lumpy when I stuffed them but the second layer of fabric seems to smooth it out quite nicely. After getting their bodies right finally I was stuck on their faces for quite a while. I wasn’t sure if I wanted to do different features for each girl but in the end I think the slight differences that come out of being handmade give each one their own personality. And then there’s the hair! Or to be more specific, Chloe’s (the blond’s) hair. Kit and Louise were pretty straightforward but Chloe’s hair is a different story. Finding the right yellow and the right cut.. I’m still not sure I have her just how I want her. I have some “curled” hair that I might try out for her instead. Can’t decide if she’s got straight hair or more wavy curls. This is something I’ve been wrestling with for a while. Maybe this is why I can’t get anyone to take the fact that I am an actual *working* mom seriously, because my work is trying to decide between straight or wavy doll hair. I should make some spreadsheets about it. Maybe a pie chart! Super cute! I adore all of the dolls you put out! Love the brown haired girl! They are so sweet. I love their hair, too. Thye look fantastic – OF COURSE. Such sweet little faces. My quilting bee stitchette arrived yesterday – gorgeous, and i love the new thankyou card! these girls are just SO SO cute. you should be proud. I really like how each little girl has a different shaped face. Adorable even in their skivvies! sooo cute, you are so clever to develop a pattern like this! well done. They are cute little rascals! they are so cute. i can tell the one on the left is feisty!! Oh they are precious! Love ’em! i love my new stitchette pattern also…thank you! wow! call me crazy but they look so much different an cuter with eyebrows!! wow! call me crazy but they look so much different and cuter with eyebrows!! Oh my goodness, I am in love and can’t wait to buy the patterns! Thanks so much. Gawd, they’re amazing. And their skivvies are beyond adorable. Whoo! 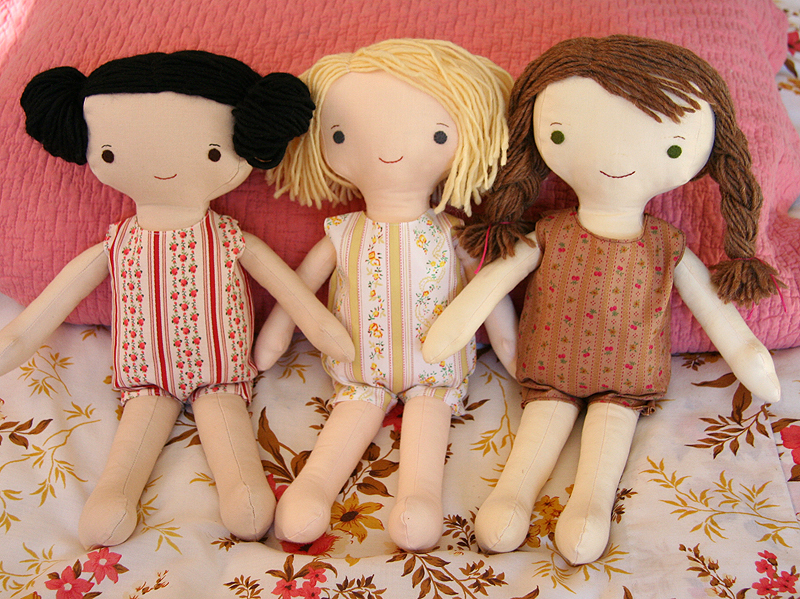 My girls and I are eagerly awaiting your new patterns for these dolls. When I saw the photo today with the three of them, I thought, “Betsy, Tacy, and Tib” You have to check out these books if you don’t know them. We are currently reading them together and your dolls really evoke what the books are about. Thanks for being such a creative inspiration. I just can’t wait to get my hands on those patterns! Are you going to do patterns for clothes too? I hope so, but if not, I have some great vintage doll clothes patterns that are sized just right for your dolls! _love_ the Betsy-Tacy books, and see they’ve been recently reprinted & think they shouldn’t be too hard to find. i ignore him of course. After making a doll this week from a pattern at the library – I just have to say, you make the hair look so easy, not to metion adorable! I love them all! You are such an inspiration. I’m working on dolls of my own and sometimes get frustrated, because I am such a perfectionist…plus I’m in the creating stage and so you can’t have everything turn out on the first time! Your work is just beautiful! So cute! I love their faces. Gorgeous ! I am obsessed with dolls clothes – currently working on riding cloaks, embroidered pantaloons and woollen felted duffle coats. So nice! I love Chloe’s hair. What a beautiful little trio! I love the variety of hair dos, and their sweet little faces. Bravo! when i was little, i had a small collection of cloth holly hobbie dolls. “heather” was my favorite – the brunette with braids. i still have her somewhere. . . these dolls remind me a little of the holly hobbie dolls, but they’re even better!! i can’t wait to see the outfits you come up with. very nice! Lovin them! Can’t wait. I am on some sort of doll making obsession right now this is perfect! Oh, they are adorable!! I love Chloe’s hair!! I think it looks really cute as is. I hope you put these out as a put together book, my daughter would love them! i love them, hillary! and chloe’s hair looks wonderful to me. So lovely. these will be so much fun to dress! Kit has such pretty hair done up like that. I’m a curly girl and when I was little ALL my dolls had perfectly straight hair. I will spare you the lengths I went to to straighten my hair but please make a curly girl. BTW, I love the dolls and the stitchette! For what it’s worth — I love her slightly shaggy staight hair. It looks like she’s just a little bit of a tomboy and has just come in from playing outside. I’d say keep it. Maybe it is because my daughter’s name is Chloe, but I think she is beautiful, with her hair as is. I agree that it looks like she’s been playing. I’m going crazy and cannot wait to start my own K, C & L! I love these dolls. I cannot wait for you to release the patterns. My favorite is Chloe. I think her hair is adorable as is. You are so very talented. I do like these dolls better than the first ones you posted. The changes you made do make them look more grown up! I would love to know how to put hair on a doll, is this going to be included somewhere? BTW – I just got the Big Footed Bunny pattern in the mail and can’t wait to start them. My son has been talking about them ever since he saw their picture while I was browsing your shop. I’m going to give them to my kids for Easter. But they wont be seasonal toys, my kids will love them all year ’round. No, credibility is measured in meetings (in my recollection of the working world.) You need more meetings, or perhaps a conference call or two…. Hi Hillary, your dolls are the sweetest! When you get the time, please check out my blog ..there is a surprise there for you! I am telling you, you are going to go down in history as one of the best, and most popular, doll makers of our time. I love everything you make, I love Olive and Archie, I love your sugarplum fairies, and I love these girls! You’re such an inspiration, really and truly. Keep up the good work. They’re adorable! I love the expressions, the hair, the “big girl” bodies…they are perfect. If you were asking for input… I love the straight hair! I love them, they are all so cute! OH! these remind me of a doll my mother made for me when I was 8 years old. Such sweet memories – can’t wait for the pattern to come!! I can not wait until these little beauties are in a new put-together book!!! My 2 youngest girls (and myself, of course) are just dying to make them and dress them up!!! Yea! A dress-up doll!! Hope they are out in time for summer birthdays! So sweet, and what a great idea using the double layer of cotton as well. I like the blonde’s hair, it just looks slightly ‘messy’ enough to look like a real child. agree…they look better longer and muslin would be better for a doll being more squishy for putting clothes on, not to mention easier to clean, well, not really sure about that. so these will be a put together book? I can’t wait and i like the suggestion earlier on doll hair instructions. that is a hard thing to do well. i do like the messy hair, if only because it looks like my girls! I’ve been having fun making Olives, I’ll be in line to buy their patterns for sure. ADORABLE! They are beautiful and amazing. All of your work and head banging paid off ! The double fabric layer is a great idea. I’ve read your blog for a while now, & have had so much fun making pointy kitties (all greatfully received), & am procrastinating re. Olive & Archie – are you going to make a pattern for these girls? They are divine, & I’d love to be able to buy a pattern some time. Thanks for the wonderful blog – wonderful pretty things to look at whilst I submit grant applications! Spreadsheets and Pie Charts are so last year ;). Trust me, I look at those suckers all day long and would rather be wrestling with dolls and fabric. You do such great work! oh MY GOODNESS. This reminds me of the doll I did when I was young. SO CUTE I have to take a picture of it…. Super duper darling dollies! I like Chloe’s hair the way it is. Don’t be afraid of the clothes- you can make patterns from paper towels- it helps a lot. They are so cute! I can’t wait for the patterns.